Super Bowl 50 brought plenty of memorable moments, plays and advertisements to look back on. While the game didn’t bring us a “left shark” to laugh at like last year’s halftime show, it did deliver a handful of ads and moments representing more than just pop-culture references. The Super Bowl remains an enormous digital performance test for advertisers, broadcasters, performers and any other brand affiliated with the big game. From Peyton Manning to the Puppy Bowl, this year shows us that brands are increasingly realizing that optimizing their digital game plan in advance will pay off with consumers. While the Denver Broncos stole the show in San Francisco, Puppy Bowl 12 was busy stealing fans’ hearts before the game even began – and perhaps too many. The little guys were playing live on Animal Planet and a dedicated online stream of the event, which proved to be too much – causing the website to crash, streams to become unavailable and fans to vent on Twitter. 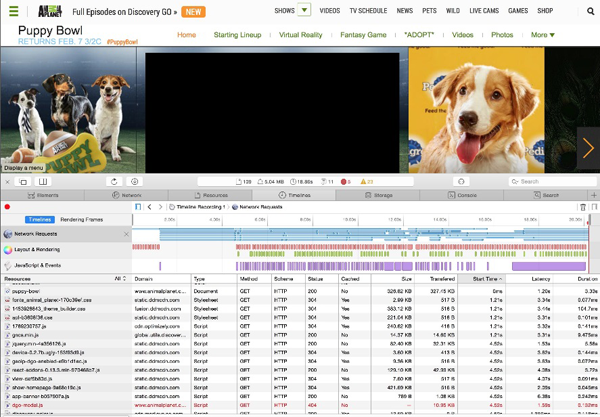 Animal Planet adapted quickly, rectifying the stumble and averting an Internet without the Puppy Bowl. It appears Animal Planet wasn’t the only one scaling to meet enormous demand, either. Following years of growth in demand for Super Bowl streaming and an increase in cord-cutting, over-the-top TV users, Super Bowl broadcasters are looking much stronger than in years past. Broadcasters are tasked with a monumental challenge of optimizing their back-end and digital properties for the Super Bowl. This year, nearly 112 million people watched the game, making it the third most-viewed broadcast in U.S. television history. And now, with more people turning online and to second-screen experiences to watch the game, the network test is greater than ever. Still, CBS did a nice job scaling their servers and actually improving performance in anticipation of the game. The graph below shows some early glitches in the days leading up to the Super Bowl, with response times varying greatly with demand. Above, you’ll notice a rock-solid performance beginning first thing Super Bowl Sunday. Similarly, NFL.com and other broadcasters performed solidly throughout the game. The lesson here? Be ready to scale in advance. Early load testing or a fully scalable data center will prepare you to perform the way CBS did. It’s a lesson that advertisers are also taking to heart. What About Advertisers’ Digital Performance? Regardless of whether you’re a broadcaster, puppy, performer or advertiser - digital performance is the new customer experience. With advertisers spending a base price of $5 million for a Super Bowl commercial, it’s crucial that websites don’t slow, stall or worst of all, crash. A recent study found that 81 percent of millennial smartphone or tablet users will abandon a mobile site or app altogether if it is slow, buggy or prone to crashing. Nearly 50 percent will abandon a mobile site if a mobile site or app fails to load within three seconds. While we have come a long way from dial-up Internet, that is a high bar set amid unprecedented levels of traffic. And, as we’ve seen every year, some fumbled, some didn’t and others thrived. We noticed intermittent outages with Marmot, Death Wish Coffee and Mini Cooper, yet each recovered quickly. Surprisingly, the only major, long-term outage was Beyonce.com after her show-stealing halftime performance sent legions of fans to her site. On the other end of the spectrum, we’re glad to see that three of the most buzzed-about advertisements of the day were also the highest performing. Congratulations are in order to the teams at Audi, Heinz and the Schwarzenegger-infused Mobile Strike as these sites held strong throughout the entire game. It’s an encouraging sign to see better digital performance across the board in looking at Super Bowl 50. Given record audiences, increasing demand, greater technical complexities and challenges, the Super Bowl class of 2016 shows how brands are increasingly realizing that online performance is just as important as the player’s performance on the field. Whether you’re promoting Peyton or Puppies, your online experience needs to deliver seamlessly -- and ideally in less than three seconds. Follow David Jones at @davidlewisjones or on the Dynatrace blog.